With over Billion of users, Facebook is now the most used and active social networking site. Although Facebook is strict against spam and fake accounts but still there are many profiles out there which are fake. After all, most of the things on Facebook are reviewed by automated bots only and people are smart enough to fool them. The basic purpose behind creating a fake profile is either to spam or to destroy someone's reputation. The person can steal your identity and private information to use it in a negative way. If you are getting friend requests from unknown people, then first you must review their profile to know if they real or not. To be on the safe side, the key rule is to add trusted and real friends only who you know in your real life. 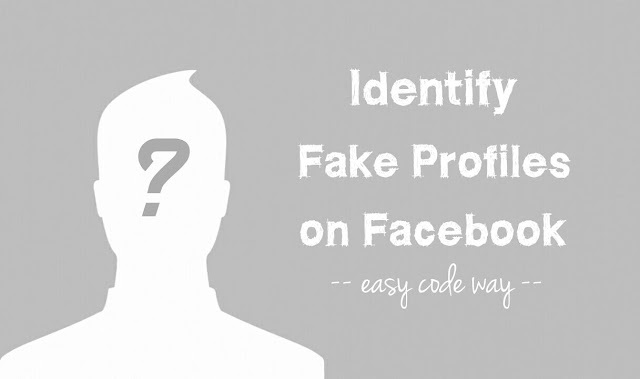 Here are few tips to investigate the case and identity fake profiles on Facebook. First download the photo and save it on your desktop. Now open any web browser (e.g: Chrome) and go to Google Images. Next, drag and drop the photo in search box. Once it is uploaded, Google will show you the exact source of image. You can also check similar photos. This will give you rough idea to identify fake profile picture. Due to some privacy issues, some people upload wallpapers of their favorite celebrity, quotes and other things. This doesn't mean that the profile is fake. It may be, but we have no solid evidence. So move on to the next level. Is there any mutual friends you have? If yes, then you're lucky. It's a great way to find the authenticity of profile. Just reach your mutual friends and ask them whether they know the person in real life or not. Sometimes, the person may add your friends intentionally so as to make you feel that he is real. Be careful and confirm this. Next, you have to check the person's friend list. Fake profiles either have very less (less than 50) or very large friends (more than 1k). If you have access to the friend list, find out what they all have in common. If you find nothing, then most probably it's a fake profile. In some cases, you may not be able to see the person's friend list due to its privacy settings. Facebook wants to make profiles more real and accurate as much as possible, so that visitors can grab exact information they are looking for. It's like a personal resume. When you visit someone's profile, you'll see about section which includes every information about the person such as education, workplace, skills, hometown, current city, DOB, mobile number, bio, favorite quotes and other things. To identify if an account is fake, you have to read the profile very carefully. Is everything looks normal and real? Address, education, workplace and bio will give you rough clues. Use your own mind here. If some of the information is hidden due to privacy settings, you can manually ask for the proof in inbox. I might not be wrong If I will say that fake accounts are usually less active as compared to the real one. In fact, this is the best way to ensure that the profile is fake. All you have to do is, just track the account activities and find out how often the user is active on it. How frequently he is posting and from which year the account is being used. If the person is already in your friend list, then you can track its account activities such as liked posts, pages, comments and other things by creating a Facebook list. This is another way to identify fake accounts. Do check all the posts and notice how much people are engaged in them? How genuine all the comments are and how many likes they are getting? Every person has at least 3-4 close friends in his life who usually like and comment on each post. As much as I have observed, a real person usually gets 100-300 likes on an average. If a post have too many awkward comments, then start getting suspicious. Now its even more easy to get fake likes and comments on Facebook by using auto bots. There are a number of third-party services available such as auto liker websites. If a person is using them, he might be fake. If you can find the reason why person wants to add you, then you can easily figure out whether he is real or fake. As already mentioned, most of the people create fake identity either to destroy someone's reputation or for spamming purpose. Once you have accepted the friend request, most probably the person will contact will first. Use your own sense to find the exact intentions behind adding you. Never ever share your private information such as username, password, bank details and private photos with anyone. There are hundreds of online frauds available nowadays. If someone is trying to be extra personal with you, please be cautious, as he might be planning something evil. These are some of the basic tips to identify fake accounts on Facebook. Once you have confirmed it, immediately cancel the friend request and make sure to block the person. You can also report the profile to Facebook. Don't forget to tell your friends as well. If you would like to add something in this tutorial, please do share it in the below comment box.